Wonder Clocks Sold by Izani-Henley and Davenports. A popular trick since its invention the "Wonder Clock" has been made in many sizes and materials. Large cigar box sized table models were made out of wood by the Victorians along with match box sized metal and plastic versions still available today. 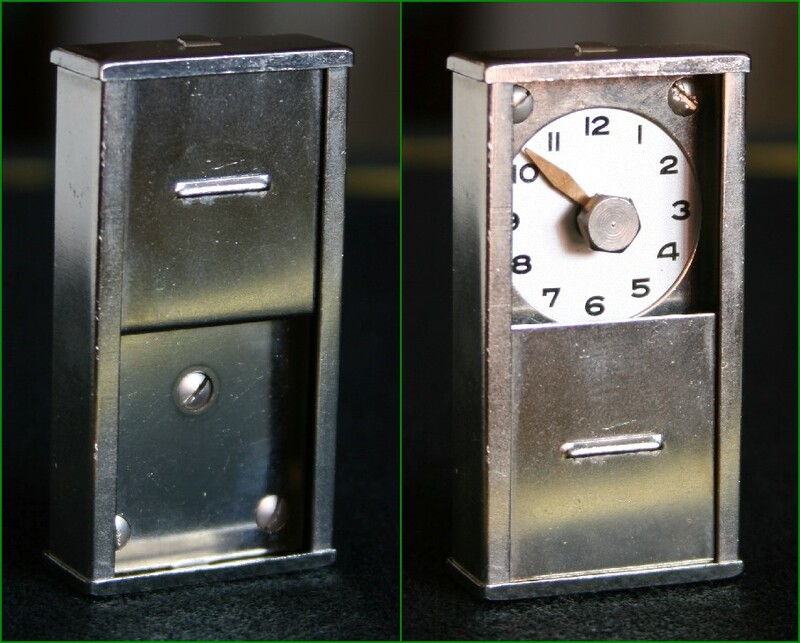 This beautifully made, chrome plated brass, model is probably the most common type you'll find. Made in great numbers in Germany and sold by many different magic companies throughout the world. The trick is a simple one, the spectator sets the hand to their chosen number and slides the cover over the dial. With the dial covered the magician can reveal the selected number. This example has its original packaging. This great little pocket trick is still being made today and you can pick up plastic versions for just a few pounds, in fact the cheap toy-like appearance makes the trick slightly more effective as it doesn't look so much like a mechanical prop. I spotted probably the largest collection of old models of this trick recently. This bumper case of "Wonder Clocks" is in the mocked up back room of the reproduction Davenports shop at The British Magic Museum. If you ever get the chance to visit make sure you do, it's superb. The "Egyptian Cabinet", a Rare Blands Exchange Box. Here's a little rarity. An ebonised boxwood exchange box manufactured by Blands around 1880. A simple effect where anything that will fit in this little drawer can vanish or change into anything else that will fit. Its method is cunningly simple though rarely used. The only explanation I could find in print comes some 70 years later in Norman Hunter's text "Successful Conjuring for Amateurs". I picked this up in a large Blands magic set. The apparatus has been used by magicians for some time after manufacture as evidenced by its contents. Inside the drawer was a small, brittle, scrap of paper which was found to be ripped from an issue of "The Magician Monthly". As luck would have it the scrap included the date, so we know some lucky magician was showing this off after May 1927. This is a very uncommon effect and the only other example of this I've been able to find was sold in a Potter and Potter auction in 2011. It is listed as an "Hamleys Egyptian Cabinet, c.1895" so presumably was sold after Hamleys purchased Blands. A photo and description can be found here under Lot 64, it sold for $375 (approximately £235 in 2011). Multiplying coin trays are still popular today, in this article we're going to look at a few examples of this fun effect. If you haven't realised already I have a particular interest in Davenports apparatus and this post is going to look at three coin trays sold by them over the years. The above is an early advert for three of their trays, though I'm not sure which of the below were available then. First up is a very plain plastic model 4 inches across. It has a gorgeous marbled green and black finish and is made of thermoset plastic (similar to Bakelite). It is very thin and has a card base. Not a wonderful quality item, especially as the gap between the edge of the plate and the slot is about an inch. No such problems with this version though, probably their best known model. Fantastic quality in heavy red Bakelite. 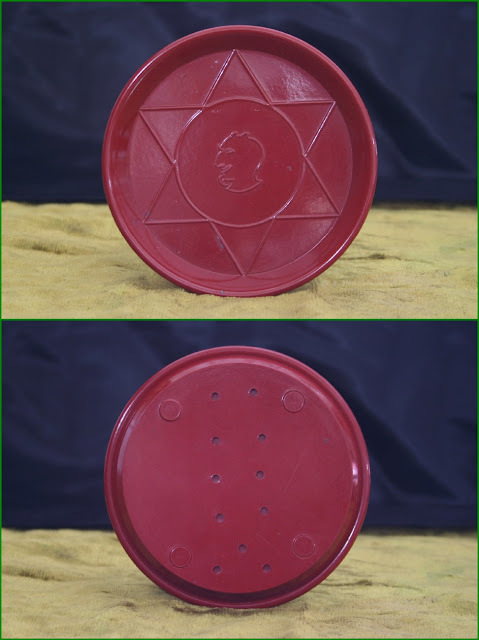 This is part of a series of three products in this distinctive plastic, all featuring the Demon head trademark, the other two can be seen at the bottom of this post. The action of this model is great and it looks like a stylish Art Deco ashtray or coaster. 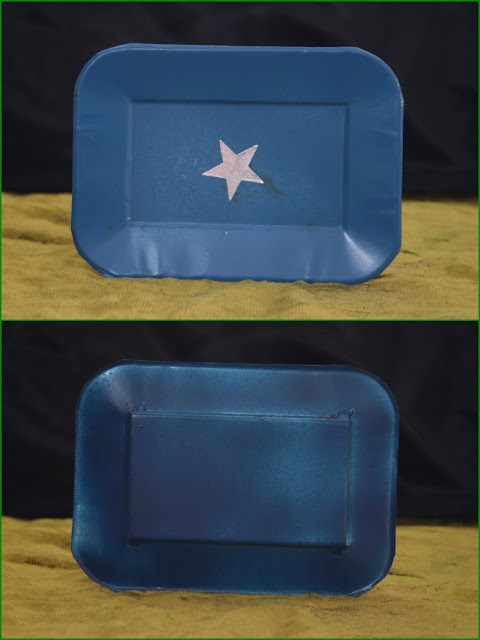 The final (and latest) model I have is this thin tin tray, sprayed blue and with a silver paper star adhered to the centre. All of these models were sold separately and in magic sets manufactured by Davenports (such as the popular Maskelyne's Mysteries sets). 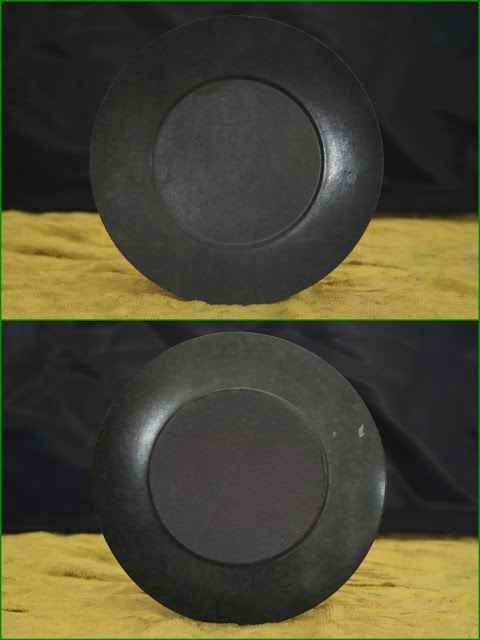 This is by no means a complete list of coin trays they made, but these are the three most common. The "Steel Ball Through Glass" trick was very popular from the 1930's onwards. It is one of the many tricks originally manufactured by Davenports and then copied extensively. Max Holden manufactured the effect under licence from Davenports, but Thayer and others plagiarised in the USA, as did companies here and elsewhere in Europe. This elegant, simple, effect uses the most innocent looking apparatus. A flat hinged mahogany box with a hole drilled right through from top to bottom, a sheet of glass which fills the interior and a steel ball. With the box closed and the glass trapped inside, blocking the hole, the ball can pass through the glass from top to bottom as shown in this advert from the trick's launch around 1937. Right from the outset Davenports' advertising was attacking imitators, though this open letter could be mainly a marketing ploy. As with most of the finer Davenports props it is marked, this time with a subtle Demon head. The locking mechanism is integrated into the clasp and makes the effect examinable. 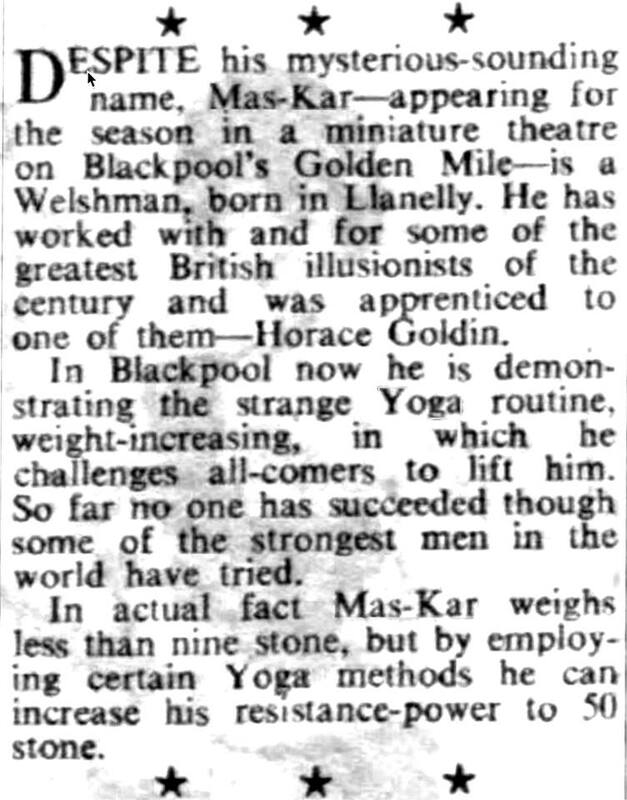 Close-up magic was building in popularity through this period so it's no surprise the effect took off. Of course the imitators cashed in on this and rolled out the copies. Here's a model I can't identify. It came in a large collection of 1950's equipment. I'm sure I've seen a photo of one of these in a Vampire or Unique advert, but I can't find it. Either way I guess it's been imported, maybe German. It certainly has a similar finish to German rattle boxes. It's a beautifully made trick and it certainly matches the quality of the Demon version. If you know who made it please let me know and I'll update here. Here's a Christmas greeting from the German magician Kalanag. A politically controversial figure he toured successfully throughout Europe and America after the second war. This postcard features Kalanag and his wife Gloria with their vanishing Hillman Minx. 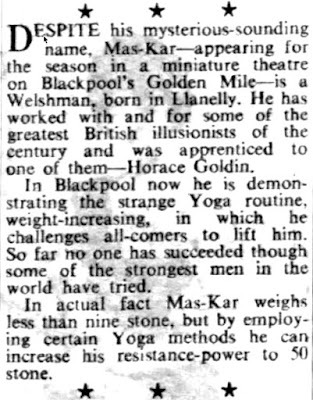 It was sent from Blackpool on 22nd of December 1954 to Albert Blackman of Hyattsville, USA. From the very little I could find on the web he could possibly have been a collector of magic magazines and ephemera. 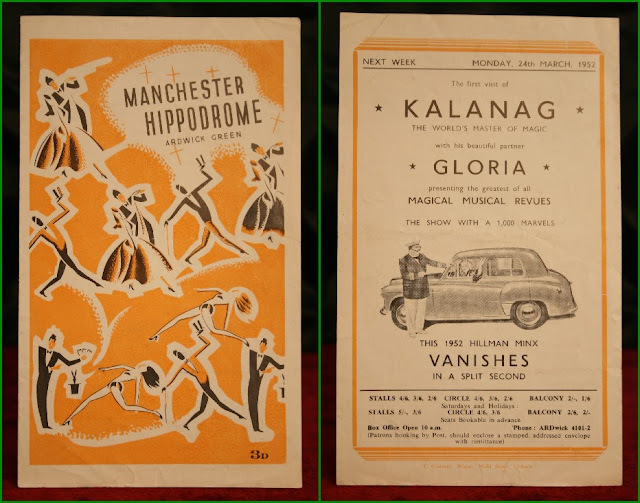 The effect featured on the front of the postcard is Kalanag's vanishing Hillman Minx, described in detail by Val Andrews in his recently reprinted biography of Kalanag. 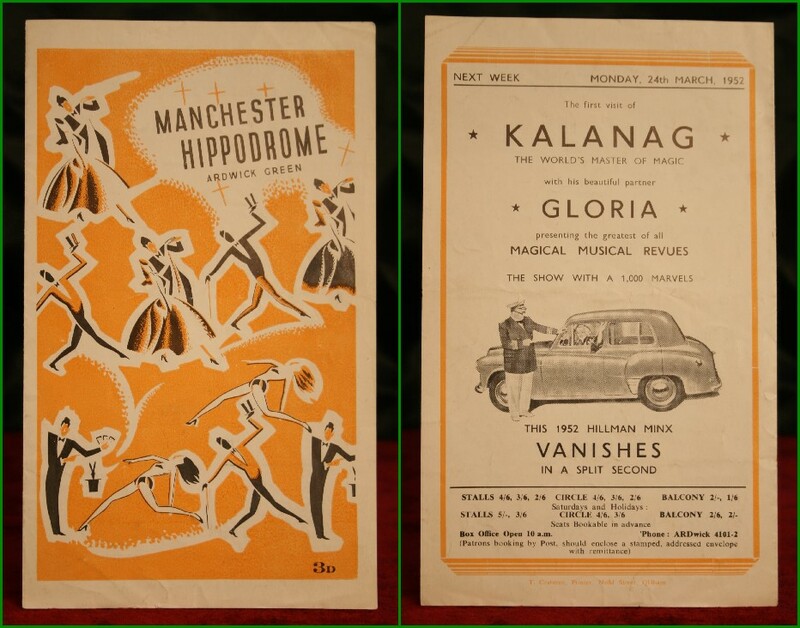 A programme featuring a picture of the magician with his car features on the back of this programme from 1952. This postcard is slightly unusual as evidenced by its condition and the stamps on the reverse. The card is quite browned and singed and the bold purple stamp reads "SALVAGED MAIL AIRCRAFT CRASH PRESTWICK 25-12-54". The stamp is presumably there to explain to the recipient the delay in arrival. The plane, a BOAC Boeing 377 Stratocruiser landed short of the runway and crashed at Prestwick Airport, Scotland on Christmas day 1954. 26 people on board were killed and much of the cargo, mainly post, was damaged or lost. There was a large salvage operation during which this postcard (and lots of other mail, £900 000 worth of diamonds, etc.) were recovered. In all a strange and sombre relic of Kalanag's career. The box was originally produced in heavily chromed copper held together with fine screws (below right) and a soldered gimmick (not shown). Towards the end of the second war, for a short while, the box was just manufactured in polished copper as the materials weren't available for chrome plating (as such the copper model is rarer). With this examinable little box silks can vanish, change and appear with the magician able to show the audience a view right through the box at any time. This popular effect found its way into many well know magicians' acts. The copper box to the left was owned and used by the Davenports before being purchased by Paul Daniels who used the box prior to selling it to myself. Davenports purchased the UK rights to this trick from Bartl but had there own marketing. Davenports were so proud of the box they had the design registered and this number, along with the Demon Series logo, can be found on the inside lids of their boxes. It's been in and out of production, I also have a 70's version of the box in slightly thinner metal. The Wonder Box did suffer from cheap copies on the market, some of which are still made and sold today. Some manufacturers created equivalent tricks instead, as shown by this advert for Vampire's "Silver Snuff Box". The above shows Max Andrews handling his latest product. Though the effects possible with the box are very similar to the "Demon Wonder Box" it is not examinable. The box works on the well known "Gung Ho Box" principle. As shown, you can see through the empty box but when closed silks can be inserted into the top and come out the bottom a different colour, or appear or vanish completely. Nowhere near as successful as the Demon box this item was released in the 1950's and quickly discontinued. In many ways this is a shame as the effect is as startling as the above and arguably cleaner in handling. Not to be outdone by Davenports, Vampire proudly stamped the gimmick on the "Silver Snuff Box" but didn't go to the effort of registering the design (which would have been tricky anyway as the secret was already in use). It is a page cut from someone's scrapbook detailing the presentation of this, subsequently pressed, flower at a performance in Leeds in 1915. The owner presumably held onto this and, upon reading of Soo's tragic death in 1918, inserted the item into their scrapbook along with the news cutting of his death. This is a particularly rare grouping that gives a striking snapshot of Soo's last few years. It was probably the best buy I've had while collecting as the dealer only asked £5 for it. I just hope he hasn't googled Chung Ling Soo's name since! There are plenty of books on Chung Ling Soo (really an american called William Ellsworth Robinson) including the recently written and superb Jim Steinmeyer book. One favourite is Val Andrew's "A Gift From The Gods", which contains superb reproductions of his posters. This is going for silly money on the internet, especially considering Davenports have got copies in stock at only £35 a pop. Will Dexter's "The Riddle of Chung Ling Soo" is also well worth a read.